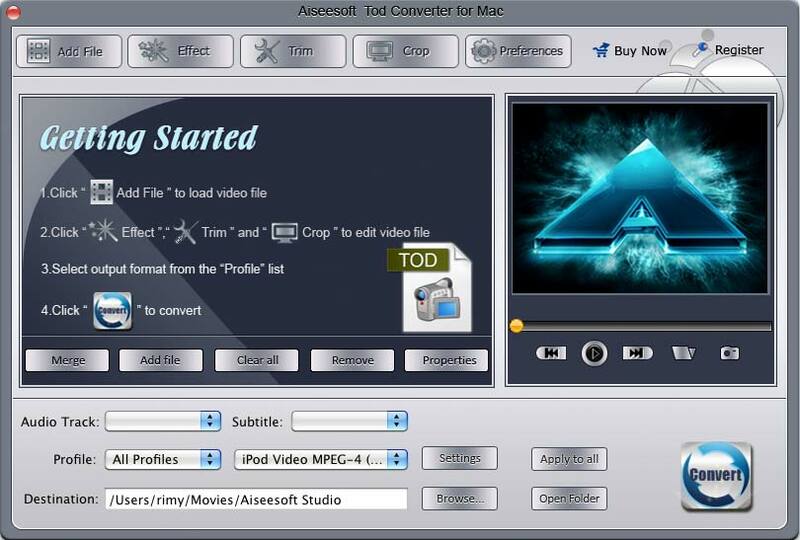 Aiseesoft Tod Converter for Mac performs to convert Tod to AVI, WMV, MPG, FLV, MOV, 3GP, MKV, etc. This Mac Tod Converter also gives you access to convert Mod file to the video format your player compatible. Moreover, Aiseesoft Tod Converter for Mac makes it easy to manage your audio files, like extract audio from Tod file and Mod to MP3, AAC, AC3, M4V, OGG, WAV, WMA, RAM for your music listening. It can Keep compatible with all popular devices. Aiseesoft Tod Converter for Mac performs to convert Tod to AVI, WMV, MPG, etc. ...... to MP3, AAC, AC3, M4V, OGG, WAV, WMA, RAM for your music listening. As the best customer-oriented Mac Tod Converter software, Aiseesoft Tod Converter for Mac provides rich options such as merging several videos, trimming any clip of video, cropping video size, setting movie effects and so forth. Aiseesoft Tod Converter for Mac software could easily convert Tod file to AVI, WMV, MPG, FLV, MOV, 3GP, etc. for iPhone/iPod/Apple TV/PSP/Creative/iRiver, etc with high speed and excellent image/sound quality. The fast Mac Tod Converter could easily extract audio from Tod, Mod to MP3, AAC, AC3, M4V, OGG, WAV, WMA, RAM with high speed and excellent sound quality. Tod Converter for Mac - Convert .tod to mpg/mp4/mov/flv/avi/swf/wmv on Mac OS. Qweas is providing links to Aiseesoft Tod Converter for Mac 3.2.18 as a courtesy, and makes no representations regarding Aiseesoft Tod Converter for Mac or any other applications or any information related thereto. Any questions, complaints or claims regarding this application Aiseesoft Tod Converter for Mac 3.2.18 must be directed to the appropriate software vendor. You may click the publisher link of Aiseesoft Tod Converter for Mac on the top of this page to get more details about the vendor.